8/14/17– Batesville Fire & Rescue is pleased to announce the installation of a backup generator at the fire station due to the contributions of the Rising Sun Regional Foundation and the John. A Hillenbrand Foundation. 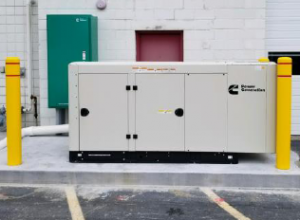 Rising Sun Regional Foundation awarded $35,000 and the John A. Hillenbrand Foundation allocated $10,000 to the replacement of the 25-year generator. The fire department also serves as the Emergency Operations Center for the City of Batesville and the backup site for Ripley County in the case of a natural disaster or large emergency. This entry was posted on August 14, 2017 by Steven Harmeyer.